The weather cleared this afternoon so I got a chance to take some photos of my new design, called "Pixie Perfection"
Didn't Vikki do a fantastic job with the quilting? Another lovely design - you are so inspiring. So glad to see you on the internet at last. Hope this encourages you to design MORE - your patterns are wonderful. 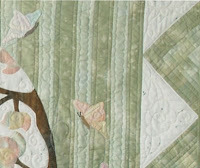 I am using the ballerina bears from More About Bears in a quilt for a 2-year-old and smile as I work on them - they are quite lovely. 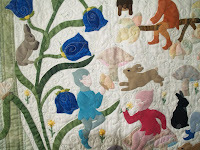 The quilting is awesome and the design is delightful. It just makes me smile to look at it. Wonderful work from both of you.